Coming on the heels of their successful FX-888 Soldering Station launch, American Hakko Products (Hakko) announced the new FA-430 Fume Extraction System and their latest IR PreHeater, the FR-870. Both items will be available May 10, 2011 and can be pre-ordered from QSource.com now. 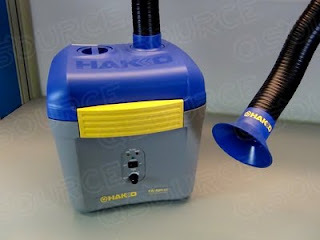 The Hakko FA-430 Fume Extraction System, a replacement for the HJ-3100 model, offers a much smaller footprint (13" W x 14.4" H x 13.5" D), quiet operation (44 - 53dB @ 1 m), and powerful suction all in a compact, ESD-safe package. Also announced with the FA-430 were two new duct kits—the Rectangular Nozzle C1571 and the Round Nozzle C1572. You can see more photos of the FA-430 on the Q Source Flickr Photostream. 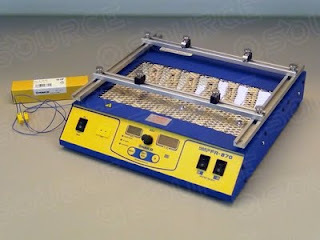 The Hakko FR-870 2-Bank IR PreHeater has two independent switchable zones, manual or auto modes of operation, soft EPO, and a compact 9.7" x 5.5" heating area. The FR-870 integrates with the Hakko FR-803B and the FM-206. You can see more photos of the FR-870 on the Q Source Flickr Photostream. Check back with The Q Source Resource in the coming days for more in-depth information about the Hakko FA-430 Fume Extraction System and the FR-870 2-Bank IR PreHeater. The Q Source YouTube Channel will also feature videos about these new Hakko products.